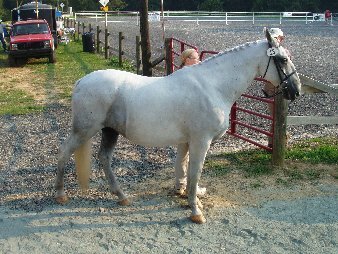 "Marti" is a 27 year old purebred Lipizzan gelding who showed in hand this year at both Fair Hill and Devon, and was honored by special mention as the oldest horse showing at Dressage At Devon in 2004. 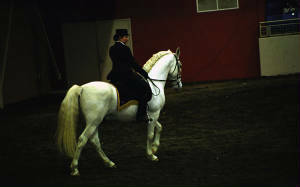 He is a wonderful Ambassador for the Lipizzan Breed, having been an exhibition dressage horse at Tempel Farms, an experienced driving horse and trail ridden, as well as shown. He is proudly owned by MALA member Terry Aycock. We are proud to honor this special Lipizzan! This is Nancy Madison's Stallion Pluto II Balmora IV. This picture was taken at the Horse World Expo in Harrisburg, PA., Feb, 2003. Pluto earned the MALA Ambassador Award in 2003. This picture was used in the posters for the east coast breed evaluation, and was taken by Lezlie Vinaccia. Pluto was gentle, well mannered and a perfect publicity chairman for the breed; he participated in dressage shows, parades, exhibitions and many, many other affairs always bringing dignity everywhere he went. He sired several foals before his death in 2004. Our sympathies forever for the passing of this beautiful stallion.